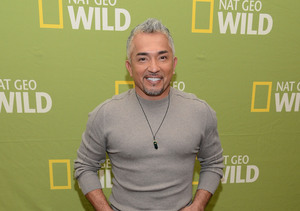 Former “Dog Whisperer” star Cesar Millan is engaged! I’m so happy!!! She said yes!!! I always knew that I wanted someone to share my life with who was sweet, adventurous, honest, and loving, but I got more than that! She is beautiful inside and out, extremely supportive of my entire family and me… AND SHE LOVES DOGS! At the end of March, Millan whisked his longtime girlfriend Jahira Dar to Greece, where he proposed during a romantic dinner at the top of Mount Lycabettus in Athens. He told People, "I wanted the proposal to be special and to surprise her, so I spent months planning our trip to Greece. I am still proud of myself that I never gave it away!" As for how he knew the actress and former stylist was the one for him? He gushed, "Jahira came into my life at just the right time. She was instrumental in helping me rebuild my life and my family after my divorce and break from the 'Dog Whisperer' television show. She is compassionate, gentle, instinctual, spiritual, intelligent, fun, strong, adventurous, and loving." Cesar was previously married to Ilusión Millan for eight years. They divorced in 2012.